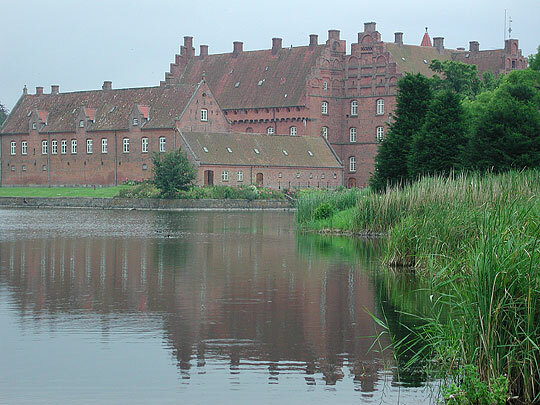 A Renaissance castle erected 1556 by chancellor Johan Friis of Hesselagergård. Two and a half floors, red brick under a red-tiled pitched roof. Resting on stone plinth surrounded by a moat. 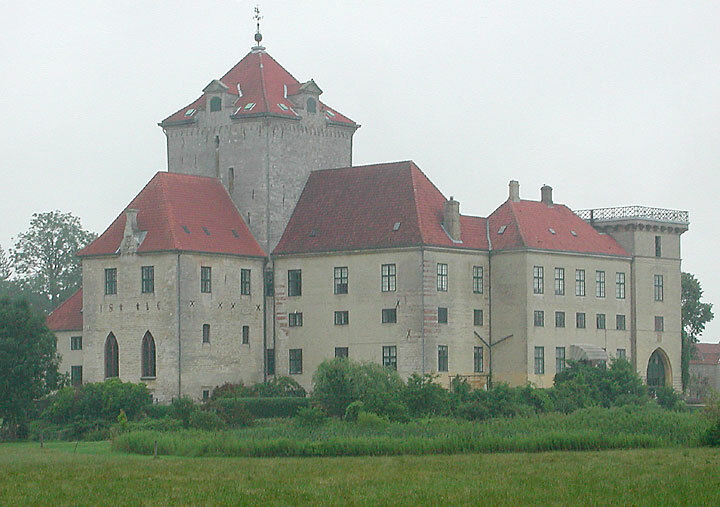 Three towers on the north side and a stair-tower on the south. 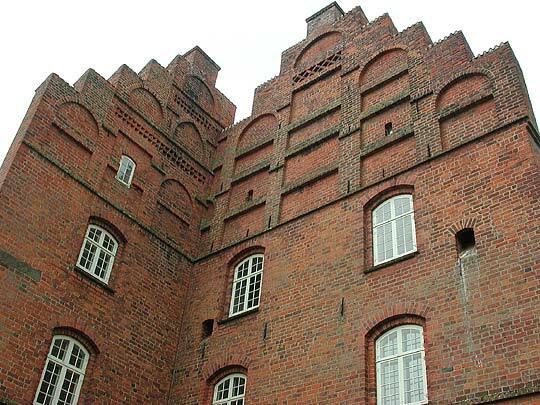 Windows with depressed arches, placed asymmetrically on the gable-sides because of the corner towers. 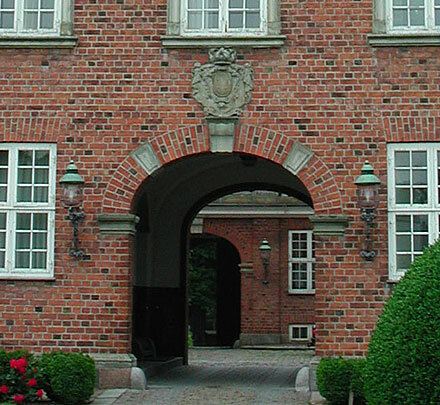 Arched friezes above each floor as on Friis' earlier Hesselagergård. The upper arches are carried on sandstone corbels. Behind these were the defensive walkway, now removed, but machicolation holes can still be seen all round the building. 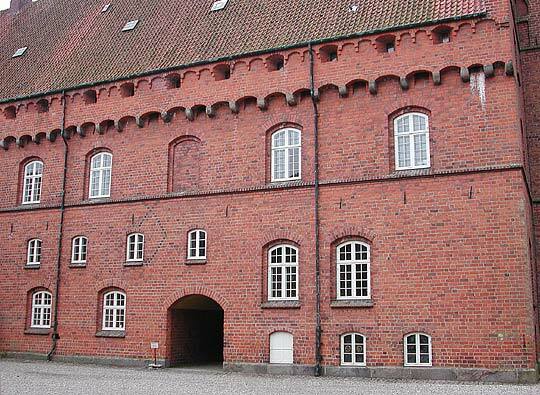 The entrance block is from 1600. 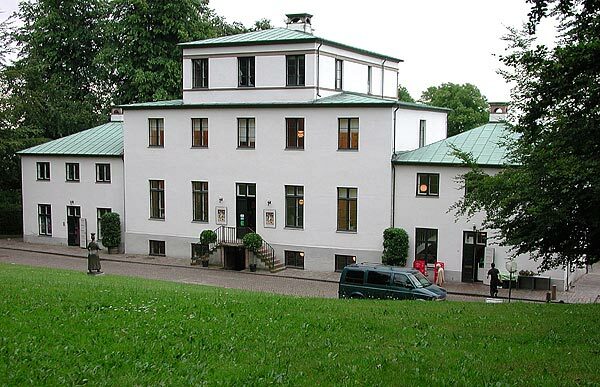 The east and south wings were built 1886-91 in a neo-rococo style by the architect Axel Berg on the foundations of an earlier rococo house by Eigtved og Anthon. Mansard roof in copper and tiles. 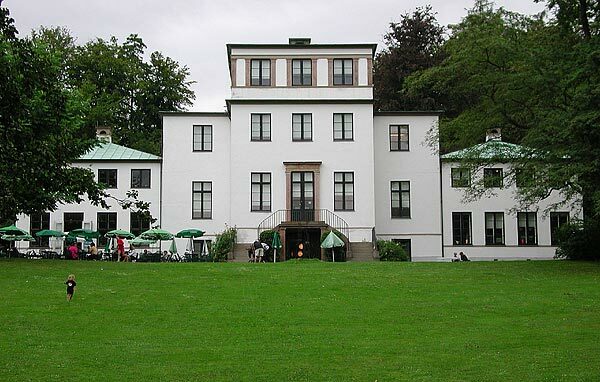 On the east wing a three-bay projection with pilasters and triangular pediment. Two-bay projections at the ends with segmental pediments. 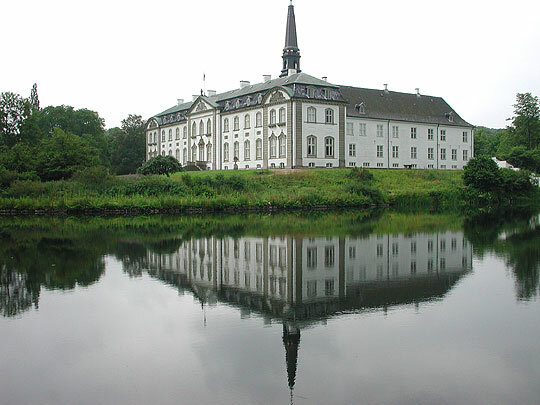 The north wing was built 1731-36 by Laurids de Thurah. Black-tiled, hipped roof. A chapel on the first floor. 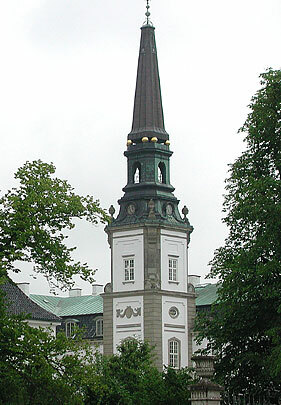 The square entrance tower with spire is also Axel Berg's neo-rococo. 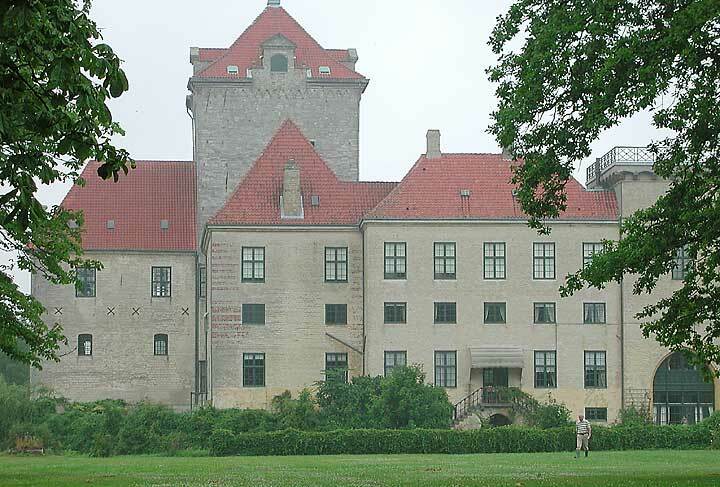 Gisselfeld was built 1546-75 by the statesman Peder Oxe. 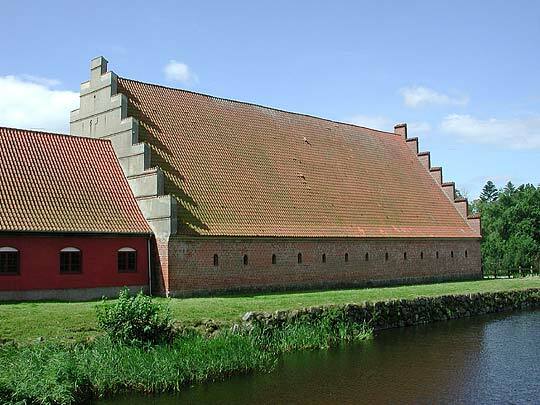 Three wings contructed of large bricks (Danish "monk stones") under a red-tiled roof. Projecting section on the north side with main entrance. 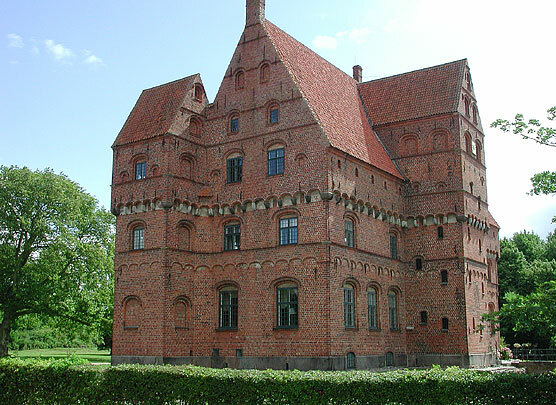 At the top of the walls a projecting walkway with machicolations and arrow slits. Round-arched windows and strip of arches below the eaves. Crow-stepped gables with blank arches. 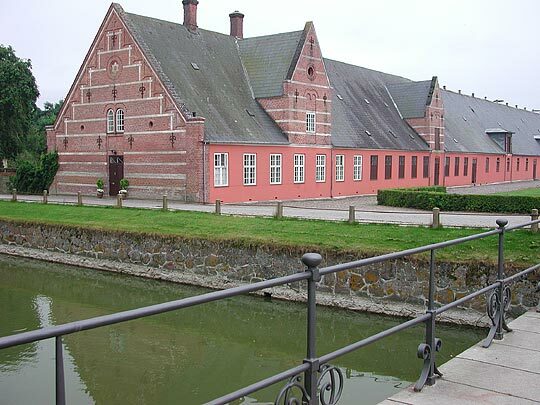 Striking resemblance to manor houses of the same period on Fyn, e.g. 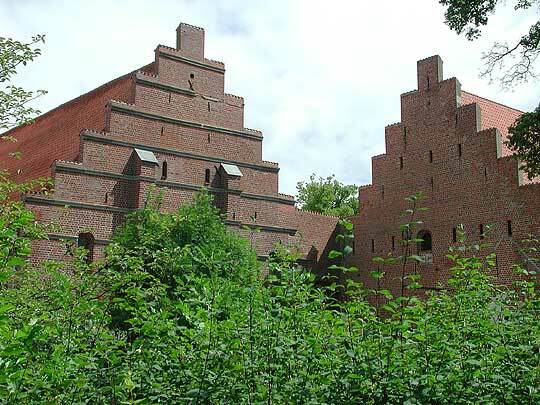 Egeskov og Hesselagergård, with their mixed "gothic renaissance" style. 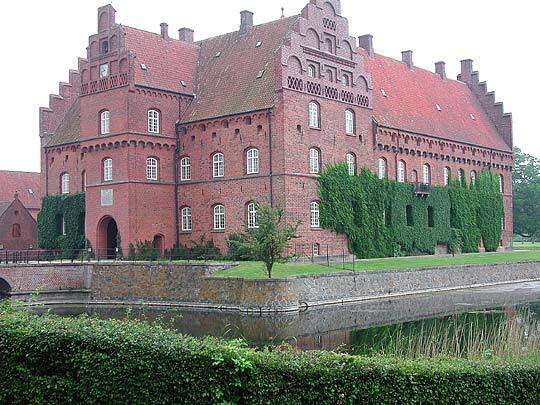 An exceptional cruciform medieval castle built around 1400 by Peder Jensen Lodehat, bishop of Roskilde. Gothic pointed windows. 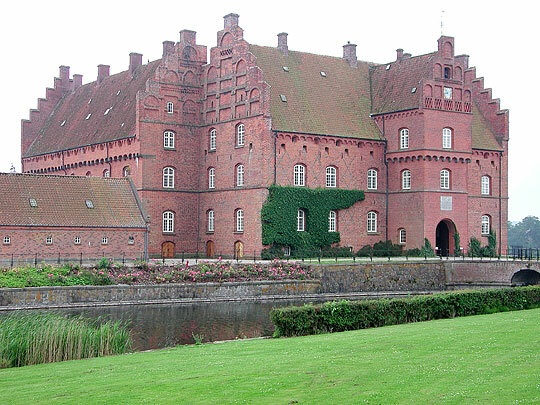 Constructed of a mixture of Stevns chalk and large bricks (Danish "monk stones") and surrounded by a moat. The central tower is of seven floors. The south arm of the cross is slightly longer than the other three. 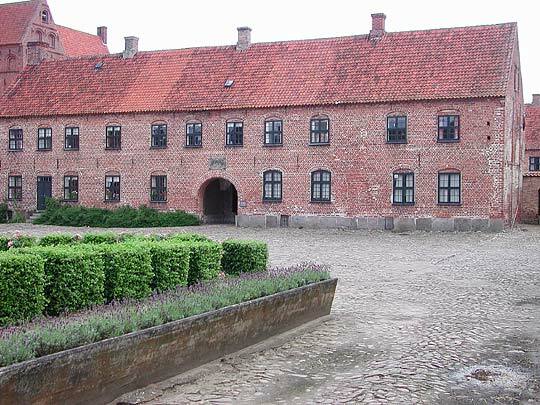 A lower north wing was added in 1638 (only just visible in the right-hand picture). 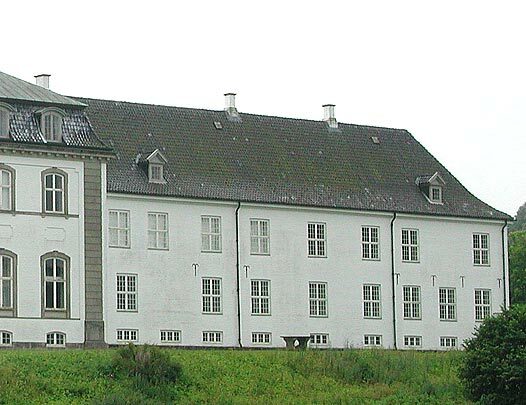 A long south wing was added in 1843. 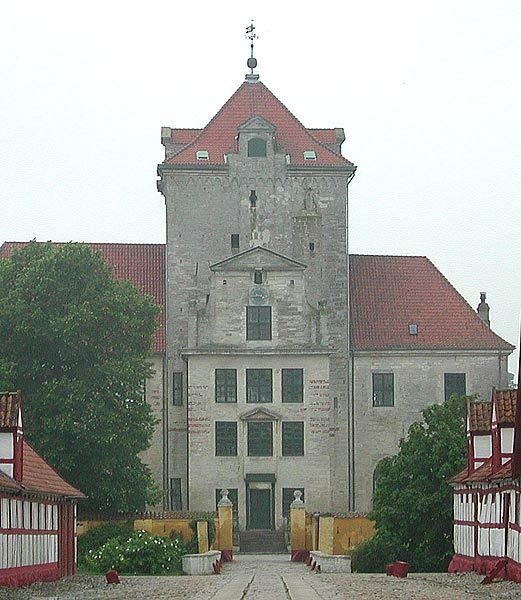 In 1666 the east wing with the main entrance was reconstructed as a stair-tower in baroque style. It stands at the end of "Broad Street" which is lined by red timbered farm buildings from 1713. The original crowstepped gables with blank arches were replaced in 1748 by hipped roofs and a pyramidical roof on the tower. 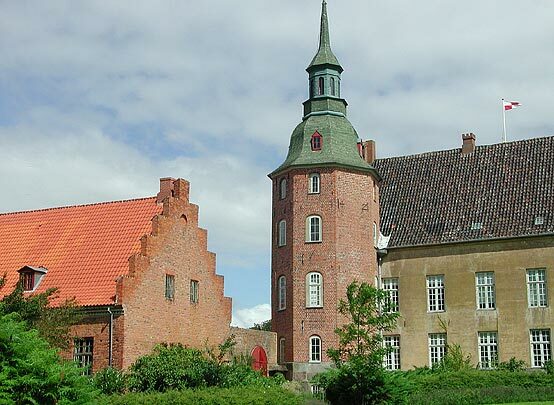 A four-winged house originally built 1598-1651 in renaissance style by the Trolle family and given the name Trolholm. 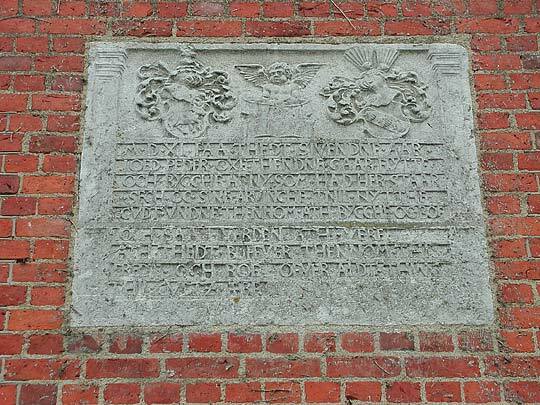 Taken over by the Holstein family in 1707. 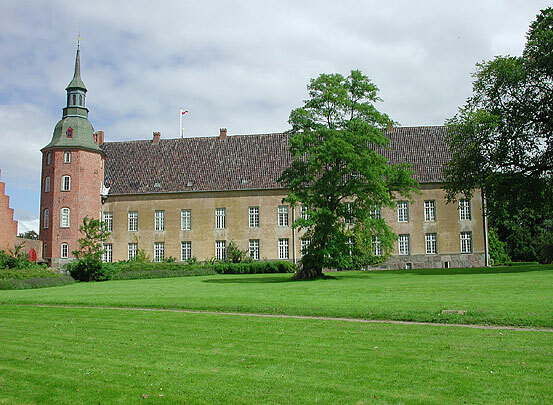 Three of the four wings were changed to classical style in 1777-81. 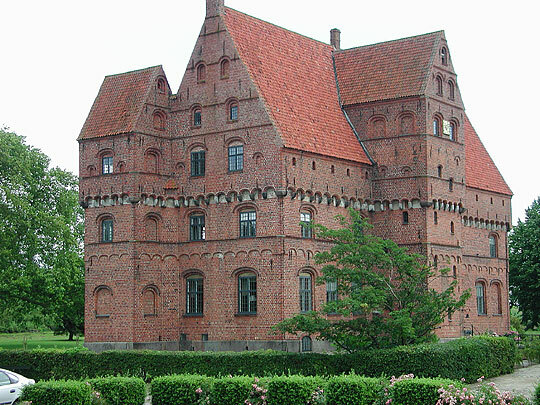 The renaissance style was retained in the west wing of which the corner tower can be seen here (whole facade at danskefilm.dk). 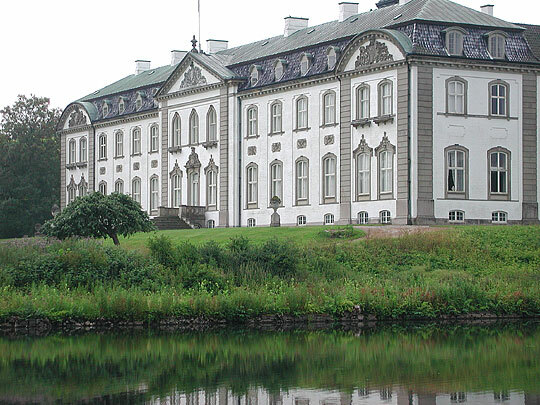 Hans Christian Andersen visited many times and had his room in the west wing. 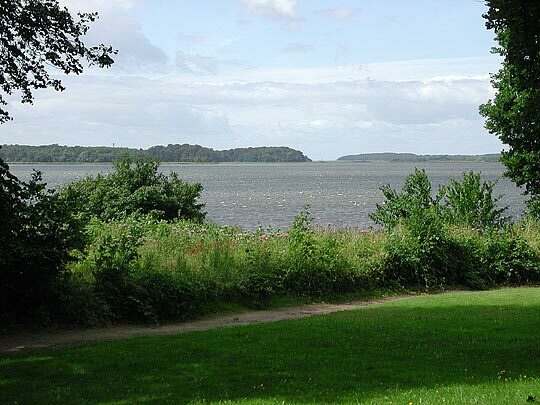 From the house and grounds there is a lovely view across the water with its many swans to the tree-covered island of Glænø and the open sea. Entrance at end of bridge across the moat. The two headless statues symbolise the headless troll in the coat of arms of the Trolle family. Elegant, clean lines in lovely proportions ... the French architect Joseph-Jacques Ramée's reconstruction in 1805 of Sophienholm in classical style for the owner Constantin Brun. 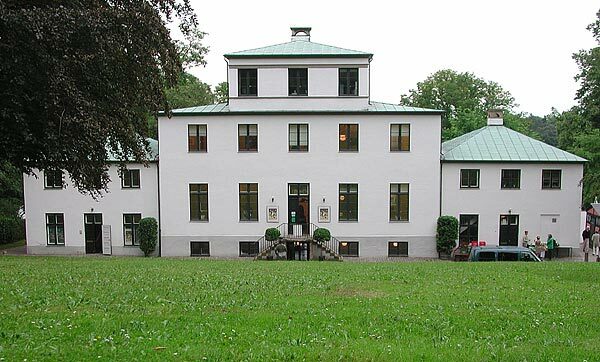 The country house was originally built by the previous owner Theodor Holm de Holmsjkold in 1768, and he named it after his wife Sophie. 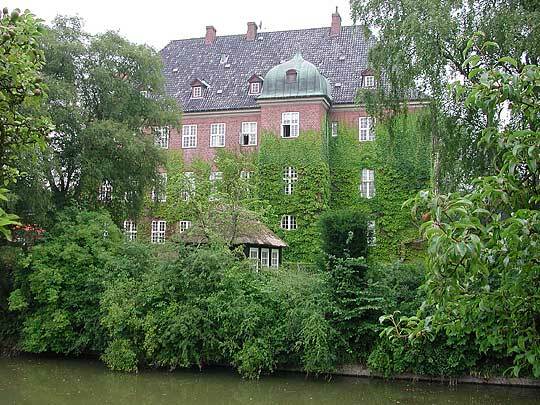 Baroque house built 1715-24 on the site of a medieval castle with a moat on all sides. The cellars still have gothic vaults and medieval brickwork. 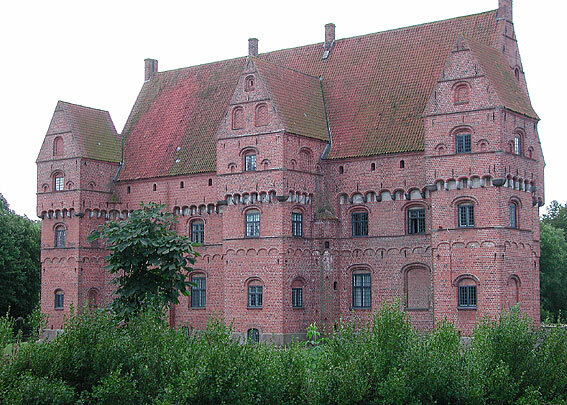 Around 1600 the castle was reconstructed in renaissance style. 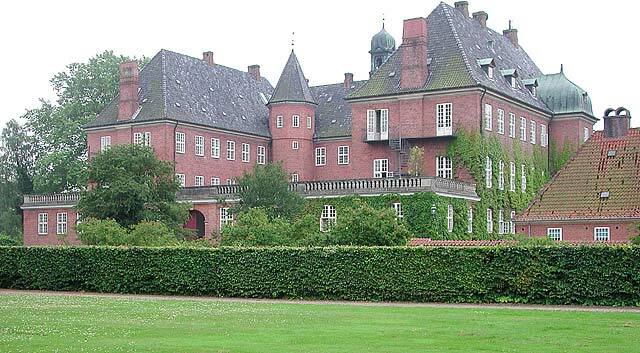 It was then rebuilt again in baroque style by the architect J.C. Ernst in 1715-24. 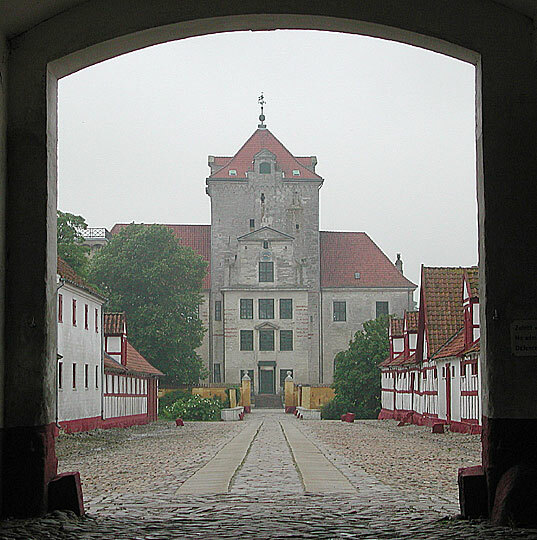 The three tall wings (east, south and west) and the stair-tower in the courtyard stem from the renaissance building. 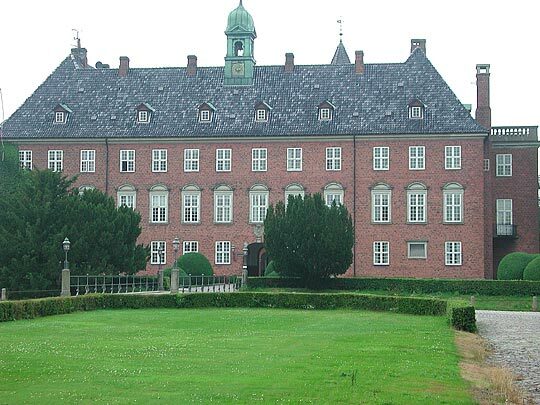 The baroque changes include the many evenly spaced windows and the addition of the low north wing. The walls were all white rendered, as was common in the baroque period, but this was later removed. 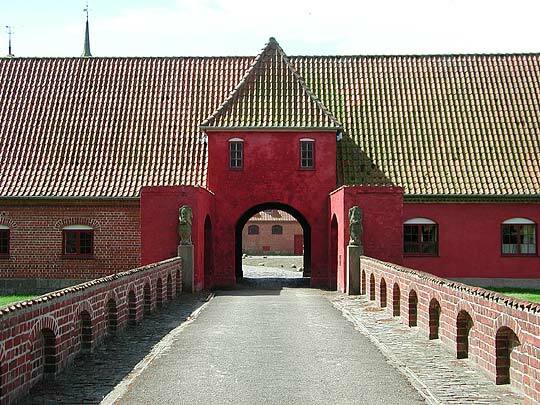 The entrance in the south wing at the end of the bridge across the moat from the farm buildings courtyard. 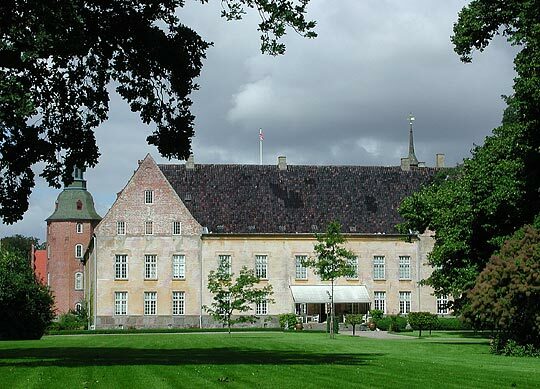 In 1735 Vemmetofte was set up as a home for unmarried daughters of the aristocracy. Since 1975 new rules have changed it into a retirement home.